Most equine senior feeds are described as "complete feeds." The term "complete feed" implies that a horse can maintain good health on that feed alone. While there are some Toothless Wonders that are physically unable to eat anything but a soaked complete feed, all horses require roughage to maintain optimal gut function and good health. Insufficient roughage is a common cause of soft droppings in elderly horses. Many dentally challenged horses live happily for years on a diet of only "complete feeds," but there is nothing like good ol' roughage to keep things moving along in a healthy manner. The most common sources of roughage for horses are pasture and baled hay, although beet pulp, alfalfa or hay cubes, and bagged chopped forage are viable options in many circumstances. For horses just beginning to experience dental problems, choice of hay and the manner in which it is presented can mean the difference between eating the hay or "quidding" (wadding the hay into balls, then spitting it out.) First cutting grass hays and alfalfa hays are usually quite coarse and stemmy. Second cutting grass hays are generally very leafy, with few stalks or seed heads, and easier to chew. Placement of hay can be very important when feeding several horses in one field. Large round bales are often not the best choice for elders, especially when feeding a large group of horses. 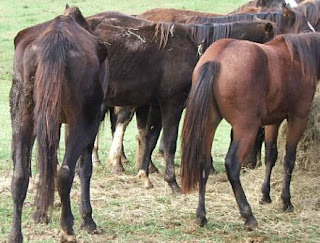 A large number of horses forced to push toward a single food source is a very unnatural way for these animals to forage. Timid horses do especially poorly in this stress laden situation. In both photos, above and below, "Lucy," an elderly mare, is the farthest horse on the left, unwilling to push her way toward the hay bale through a crowd of younger, more dominant horses. A much better way to feed hay to elders (or any groups with submissive horses) is to divide the hay into more portions than there are horses, and place the portions several horse lengths apart. Appropriate spacing of enough hay piles ensures that timid or weak horses will have access to their share. The horses shown grazing above have voluntarily chosen approximately three body lengths each as their comfort zones. Placing hay portions in a comparable pattern ensures all three can eat in comfort. Spacing numerous hay piles some distance apart has a second benefit. It allows horses to mimic the meandering fashion in which they graze. Horses wander from one pile of hay to another just as they wander from one patch of grass to the next. It is unnatural for a horse to stand in one spot to eat for long periods of time. The horse's digestive system evolved to serve an animal "on the move," and functions best when he is allowed generous opportunity to perform that movement at will. 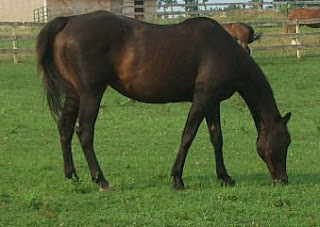 "Lucy," approximately 8 months after being moved to Traveller's Rest and a more appropriate feeding style.